In five short years, Atlanta Mayor Shirley Franklin has reversed the course of a city. If you look closely at Shirley Franklin, if you push past the no-nonsense administrator, the skilled negotiator, the vigilant steward, the popular, bridge-building mayor who has energized Atlanta’s business community for the first time in decades, you’re left with a defining insight into her success: sheer willpower. Franklin uses the term herself in citing the example set by Coretta Scott King and other civil rights leaders who found the resolve to push, against all odds, to right wrongs and drive reform. Clearly, opportunities for women and other minorities have expanded dramatically over the decades (even as politics has become more retrograde), but what were the odds of a blonde, middle-aged black female who’d never run for elective office in her life becoming mayor of Atlanta? And yet, in five short years Shirley Franklin has seemingly reversed the course of a city hamstrung by corruption and mismanagement, a city bleeding red ink as surely as its antiquated sewers were bleeding wastes, where the toxic fumes of cynicism and discouragement afflicting so many urban centers had begun to seep. With an unlikely combination of can-do enthusiasm and rigorous discipline, Franklin has rekindled the sense of promise, rebirth and reconciliation that defines the best of Atlanta. 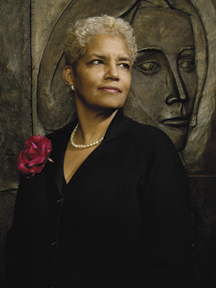 For these and bottom line accomplishments like balanced budgets, improved policing and ethics reform, for her tenacity in pursuing visionary projects like the Beltline and the acquisition of the Martin Luther King, Jr. papers, Shirley Franklin is Georgia Trend‘s 2007 Georgian Of The Year. Franklin, whose leadership has been hailed in Time magazine, U.S. News & World Report, The Wall Street Journal and numerous other media outlets, calls herself an “unintentional politician,” a phrase that precisely captures her approach to governance. Predecessors Bill Campbell and Maynard Jackson were lawyers, adversarial in training and approach; Franklin is a sociologist with a keen understanding of human interaction and dynamics that serves her well in the difficult negotiations, the give and take, the compromises and tradeoffs, that are so vital to her job. Make no mistake, behind the exuberance, the offbeat fashion sense (more SoHo than Buckhead), the warmth she exudes in person, Franklin is tough as nails. Franklin went on to serve as chief administrative officer and city manager for Andrew Young and executive officer for operations in Jackson’s third term. Projects like airport improvements, construction of the new City Hall and Municipal Courthouse and Centennial Olympic Park proposals all passed across her desk. As ACOG’s senior vice president for external relations, she quietly built bridges to the communities and labor unions, relationships that have served her well. In 1998, Gov. Roy Barnes appointed her to the Georgia Regional Transportation Authority Board. In short, Franklin mastered the day-to-day, nuts and bolts operations of the city from the ground up and, despite what her few critics allege, she did it without the push and pull, sturm and drang of partisan politics. When Franklin (at the urging of Andrew Young and Maynard Jackson) decided to run, Atlanta existed under a cloud of corruption. For eight years, her predecessor, Bill Campbell, had run City Hall almost as a criminal enterprise. When the dust settled, Campbell was convicted of tax evasion and sentenced to 30 months in federal prison. A dozen other individuals, senior city officials and contractors among them, were either convicted or pleaded guilty to bribery and other charges. In November 2001, Shirley Franklin was elected mayor, barely winning 50 percent of the vote. She walked directly into an $82 million dollar buzzsaw, a budget deficit $37 million higher than projections. Atlanta’s turn-of-the 20th century sewer system was in violation of the federal Clean Water Act; the EPA was fining the city $20,000 a day. Potholes outnumbered pedestrians, and a surging homeless population was threatening to blunt the vital downtown housing boom that had blossomed after the Olympics. Franklin acted quickly and decisively, pushing the city council to sign off on a one percent sales tax and a hefty hike in property taxes that left intown homeowners howling, but also wiped out half the deficit. She cut 1,000 jobs from the city payroll and instituted a hiring freeze. She demanded that city employees turn in nonessential cars and cell phones. She cut her own staff by half and took a $40,000 pay cut, a painful but effective piece of political theater. She turned her attention to the bubbling sewage crisis with an enthusiasm reminiscent of Ed Norton in “The Honeymooners,” even dubbing herself the “Sewer Mayor.” Franklin constantly lectured hapless constituents on the finer details of sewage treatment and infrastructure while quietly building bridges and mending fences with congressional, county and state officials, ultimately negotiating a package of loans and other agreements that allowed the city to embark on its ongoing $3.2 billion “Clean Water Atlanta” overhaul. Upon taking office, she’d marshaled a battalion of private sector companies as consultants – often on a pro bono basis – to audit and, in effect, deconstruct Atlanta’s budgetary, infrastructure and social services responsibilities. Bain & Co., for example, conducted a comprehensive study of the city’s finances. Franklin, who is 2006-07 president of the Georgia Municipal Association, expanded the city’s talent pool, tapping executive search firms to recruit candidates for chief operating officer, city attorney and police chief positions. “Mayor Franklin is very unusual because she’s willing to ask the business community to help her solve problems and identify opportunities at the embryonic stage,” says Sam Williams, president of the Metro Atlanta Chamber of Commerce. “For example, she brought the business community in to help her on the sewer crisis and we, in turn, appealed to her to help recruit Novelis.” (The packaging and building materials company established its headquarters in Atlanta in December 2004.) Franklin was a player in Atlanta’s vigorous but unsuccessful bid for 2009 Super Bowl and its successful 2008 NCAA Final Four bid. “Seized” is probably the operative word. Franklin is as unhesitatingly unsparing and transparent in answering queries about her personal and professional experiences as she is about the city budget. There were certainly doubters, particularly in her first term, and unspoken messages about her competency, gender and marital status (divorced mother of three). In that toxic mix, Franklin’s race was not the predominant factor. This was true when Franklin was 13 years old and attending the intensely competitive Philadelphia High School for Girls (diva Marian Anderson’s alma mater) and studying “six hours a day and all day Saturday” determined to break into the top 25 percentile of her class. She did. And it remains true in her second term (“Three years and two months to go,” she grins) as she begins to focus on issues – poverty, education, population growth, infrastructure, water, pollution – that will impact Atlanta and our nation not years, but decades, after she’s left office. One senses that this mayor’s career arc is still accelerating, that her future is wide open, and yet she remains fascinated and intrigued by a city – so much like Shirley Franklin herself – that is constantly transforming, surprising, and forever seeking its stride.